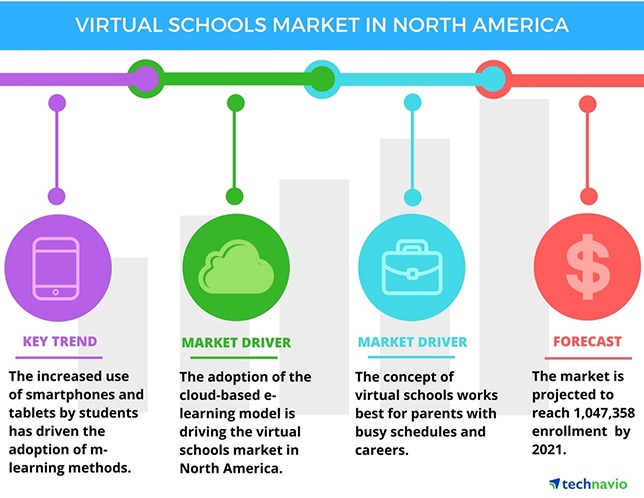 The virtual schools market in North America is expected to grow at a compound annual growth rate of almost 13 percent from 2017 to 2021, according to a new report by market research firm Technavio. The report states that Technavio analysts forecast the virtual schools market in North America to grow to more than 1 billion enrollments by 2021, though there are fewer than 1 billion people residing in the United States and Canada, the researched countries. Rise in custom learning methods. The report notes that the target audiences for the virtual school concept are parents with hectic schedules, people with a high mobility career, and children of families that are unable to admit their kids into normal schooling due to various issues like lifestyle, place and time zone difficulties. Furthermore, the availability of a number of courses and flexible timing options that is the core strength for virtual schools will also significantly boost the growth of the market. “E-learning course providers are creating and delivering content based on the availability of innovative new technological tools, which have become a crucial part of online education or training systems,” said Jhansi Mary, one of the lead analysts at Technavio for education technology research, in a statement. Other prominent vendors include Abbotsford Virtual School, Alaska Virtual School, and Basehor-Linwood Virtual School. The study provides a detailed industry analysis based on ownership — private education management organizations, or EMOS, and non-profit EMOS. According to Technavio’s report, the virtual schools operated by private EMOS dominated the market in 2016, and are expected to grow more in the next five years. Factors such as advanced facilities, average student-teacher ratio, and the on-time graduation rate boost student enrollments in private EMOS. The student-teacher ratio in private EMO virtual schools is around 40-to-1, when compared to U.S. public schools, which are approximately 16-to-1, the report said. Moreover, the on-time graduation rate in these full-time virtual schools is over 50 percent. This will attract parents to enroll their kids into private EMOS, further driving the growth of the market, Technavio said. The 82-page report is priced at $3,500. To request a copy of the Technavio report, visit this Technavio site.